Joyce O’Sullivan (Castriotta) from Concord, MA passed away peacefully with her husband by her side on February 5. Joyce is daughter to the late Victoria (Raposa) Castriotta and Matthew Castriotta from Fox Point, RI and Mother to the late Frank Mendes from Oxnard, CA. Joyce is survived by her beloved husband of 36 years, Paul O’Sullivan, her daughter Pamela Mendes and her granddaughter, Victoria Rose Dean. 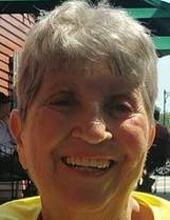 Joyce grew up in Fox Point, RI and raised her family in North Providence. Joyce and Paul lived in California for many years before they retired to Concord, MA. Joyce was a free spirit with a mischievous sense of humor. Her colorful personality and love of a good laugh drew many to her. Joyce had a robust love of life. She loved nothing more than to cook a homemade meal and enjoy her family and friends. She will be deeply missed and remembered always. "Email Address" would like to share the life celebration of Joyce A. O'Sullivan. Click on the "link" to go to share a favorite memory or leave a condolence message for the family.